When designing your author website, choosing the font for both your site’s header and body text can be just as important as the overall design. 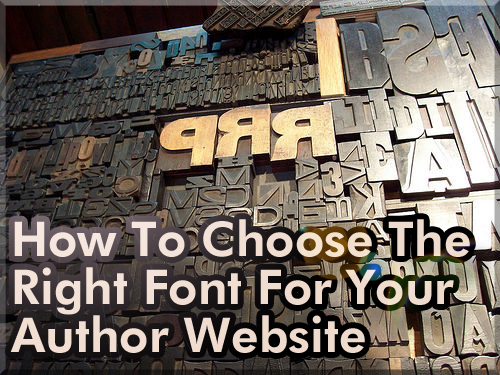 Below, we’ll answer some of the most important questions to consider when picking a font for your author website. While it may seem trivial, determining which font to use is one of the most significant decisions you’ll make when designing your website. The main reason people visit your author website is to read your content. Presenting what you have to say in an easy-to-read, crisp font will make the difference between keeping—or losing—your audience. Another reason font choice is key to a successful author website is how it affects your personal branding. If you hope to be a professional writer, getting your name out there in the world is just as important as writing and making submissions. The right font will display your name in a way that not only complements your site’s design, but also represents your personality and establishes tone. Finally, due to the many variables in website browsers, not all fonts will be visible to all users. For this reason it is vital you choose a font that works with all browsers, otherwise your site will default to Times New Roman. What are the dangers of poor font choices? While making the appropriate font choices will definitely boost your appeal among visitors and possible fans, choosing a typeface that’s hard to read and over- or under-sized will quickly discourage potential fans from sticking around your author website. Poor font choices will also make your author website appear amateurish to literary agents, which may jeopardize your potential for representation. How do you choose the right font for you? When choosing a font for your author website you want to keep a few things in mind. First and foremost, the font you choose must be legible. Remember that simpler is better. Intricate fonts may be elegant and enticing, but when it comes to the text that covers most of your site, simple and legible will be much more appealing to your readers. If a visitor has trouble reading what you’ve posted on your author website, he or she will leave quickly and be less likely to return. The next factor to consider when selecting a font for your author website is the look of your site’s header. A common trend in author website development has been to display the author’s name in a large stylized font at the top of a site. You can allow yourself a little more freedom when choosing a font for your site’s header. Keep in mind your personality and the tone of your work. Pick something that not only has visual impact, but is also clear and complementary to the font used for your site’s text. What is the best color for your font? Once you’ve decided on the best font to suit your author website, you must consider how you are going to style it. The higher the color contrast, the more legible the text will be. The best choice is the one that will give your readers the least eye strain—black type on white or colored background. Pro Tip: Pick one color for the body text and stick with it. Using multiple text colors looks unprofessional and amateurish. QUESTION: What is your favorite font? My favorite is Comic Sans. It looks personal and not formal. I write a blog of real-life humorous stories, so it fits. I understand that verdana font was designed specifically for internet — with clarity in mind. Fonts have a message all their own, and you said it — they are part of the brand.